As a gluten-free blogger, I am always seeking delicious fare that's safe, which has brought me from time to time to some pretty funkiest food joints that are as much about good food as they are about establishing a unique vibe and character. Of all the restaurants with character I've eaten at, most pale in comparison to Washington D.C.'s Busboys and Poets, an innovative, vibrant multi-location combination bookstore and restaurant that is as self-assured as it innovative. What's cool about Busboys and Poets is that they pride themselves on being a neighborhood-centric space where consciousness can be uplifted, and intersecting conversations can change and empower the world. This mission is radical in that there are so few places founded with this clear intent and purpose, and I immediately felt this energy from the moment I walked in. The location I visited was nestled in the Mount Vernon Triangle neighborhood and is very much a local hangout, not a touristy destination. The location is perfect- close enough to Union Station and central D.C., but far enough that tension of center city is lessened a bit. Inside Busboys and Poets, the interior is just plain cool. I loved the centerpiece spiral staircase, and taking in the sunlight dining room and different types of art. The menu is seasonally inspired, and indicates which items are gluten-free, vegetarian, and vegan. The options are plentiful in each category, and plenty of items check off two or three of the attributes. As with any marked menu, be sure to let your server know your restrictions so they can alert the kitchen, and double check to make sure your food meets your dietary requirements. Beyond dietary restrictions, local, organic, and humanely raised ingredients are sought out as well. Overall, the menu is expansive and inclusive to any type of eater. To see it in its entirety, click here. For sandwiches, Busboys and Poets works with Rise Bakery (review coming soon) to bring gluten-free bread to their menu. Rise Bakery is a 100% dedicated facility, but I don't know if the loaf they use is the dairy-free one or not (I forgot to ask). 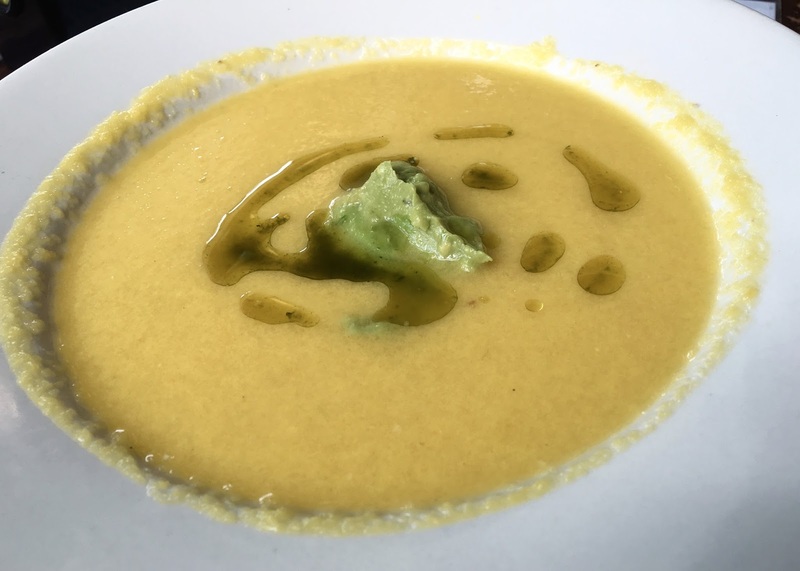 I ordered the vegan yellow tomato gazpacho, which was served with a dollop of guacamole and topped with basil oil. For me, nothing says summer better that yellow tomatoes, and this soup delivered my three of my favorite flavors in unforgettable fashion. The soup was cool and thick, with the bright flavor of yellow tomatoes placed center stage. The basil oil added a hint of pesto that made each spoonful pop, and the guacamole provided a creaminess that provided a nice contrasting taste and texture profile. As a second dish, I also ordered the vegan tabbouleh, a dish rarely gluten-free because it's typically made with bulgur wheat. 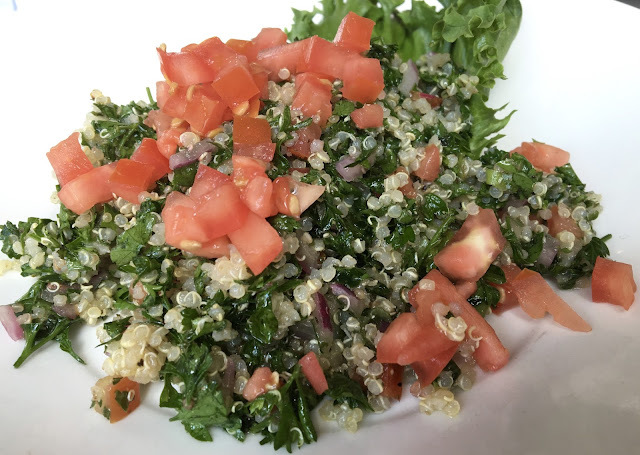 Busboy and Poet's version is made with quinoa, parsley, tomatoes, red onion, and lemon juice. This dish is flavorful, and like the gazpacho, a perfect pick on a hot D.C. summer day. The tabbouleh showcases the simplicity goodness of pairing fresh ingredients together without overcomplicating them. I totally fell in love with Busboys and Poets, and plan on making it a must-do any time I visit the District. With good food and a good vibe, this local hangout has character and authenticity that comes from consciousness and commitment to community. 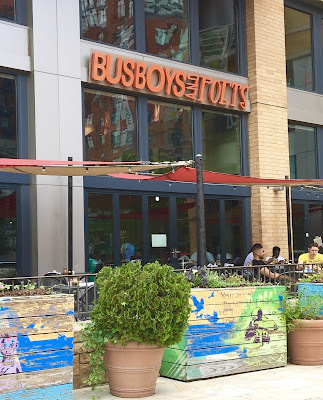 My food was excellent, and the menu is easy to navigate as a restricted eater, so by my gluten-free standards, Busboys and Poets is a total win for this foodie. Special Features: Order Busboys and Poets online to go right here.